The scorecards say a foursome from Nevada Realty won the No To Abuse Golf Tournament on Saturday at Mountain Falls Golf Course, but the real winners were some of the most vulnerable members of the community and the people who are there to assist them. 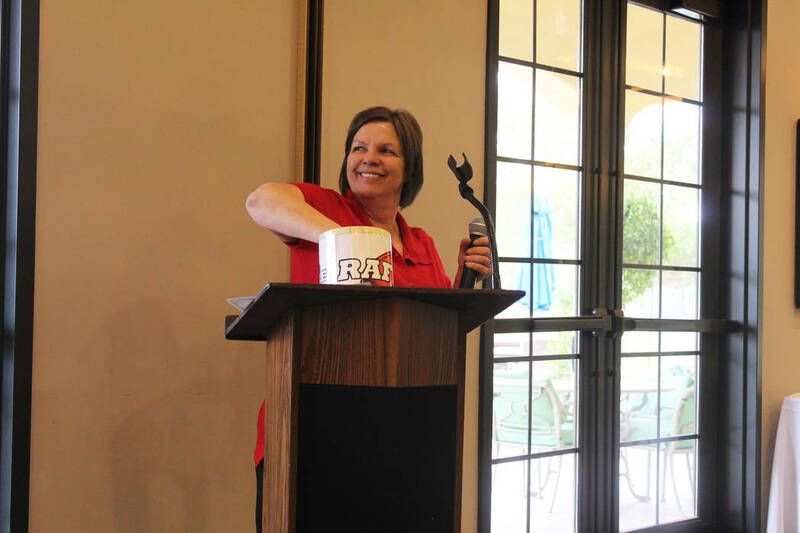 Tom Rysinski/Pahrump Valley Times Nevada Outreach Executive Director Salli Kerr pulls a winning raffle ticket after the No To Abuse Golf Tournament on Saturday, March 10, at Mountain Falls Golf Course. 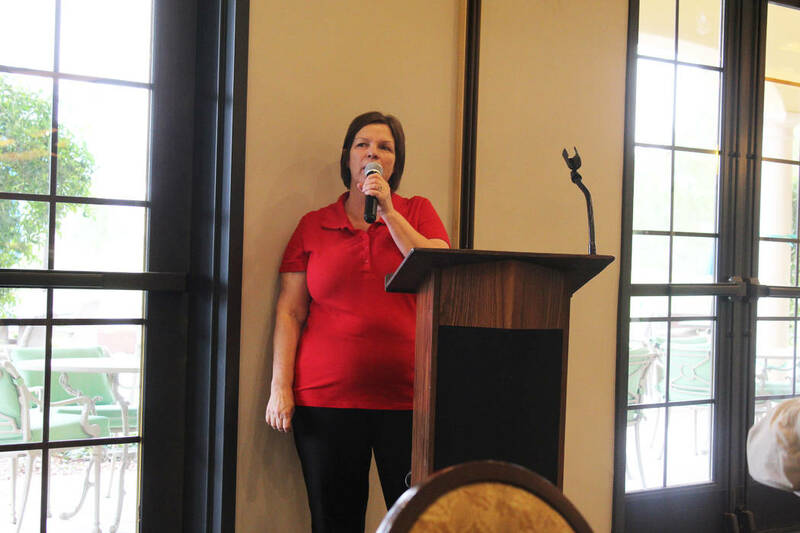 Tom Rysinski/Pahrump Valley Times Salli Kerr, the executive director of Nevada Outreach, addresses the audience after the No To Abuse Golf Tournament on Saturday, March 10, at Mountain Falls Golf Course. 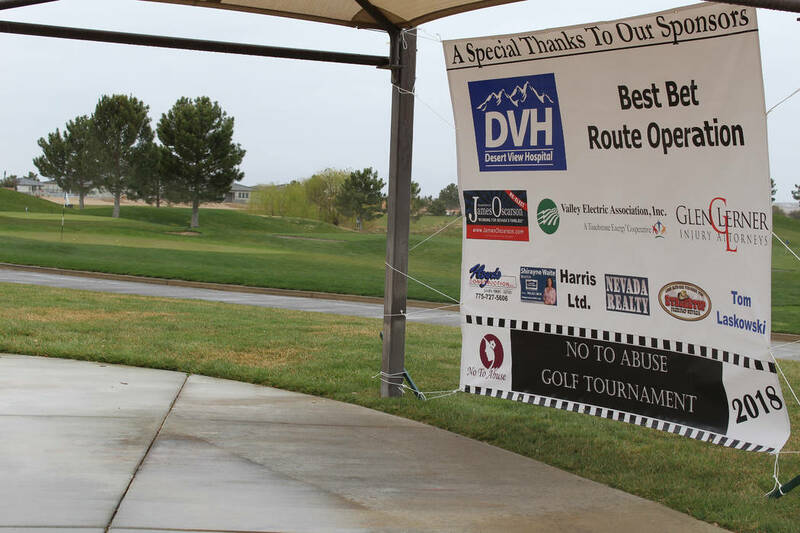 Tom Rysinski/Pahrump Valley Times Despite a gloomy, wet day at Mountain Falls Golf Course, the No To Abuse Golf Tournament drew 14 foursomes and raised money for No To Abuse of Pahrump. The event raised money for No To Abuse, which has served victims of domestic violence and sexual abuse in Nye and Esmeralda counties since 1995. Money was raised from the entry fees for the tournament, sponsorships and the sale of raffle tickets. Raffle prizes ran the gamut from a $50 power credit from Valley Electric Association to Easter baskets provided by Pahrump Valley Disposal to dinner and a movie from Platinum Home Mortgage. Kerr said corporate sponsorships were at multiple levels. Desert View Hospital provided breakfast for the event, while the post-tournament lunch was courtesy of Best Bet Route Operation. Eagle Sponsors included VEA, Glen Lerner Injury Attorneys and James Oscarson; Birdie Sponsors were Harris Ltd., Floyd’s Construction and Shirayne Waite, Realtor; while Stagestop, Nevada Realty and Tom Laskowski were contest sponsors. Kerr added that one eagle sponsor wanted to remain anonymous. Oscarson serves as chairman of the No To Abuse board and has been involved in the organization for several years. Oscarson thanked the sponsors and Mountain Falls during his remarks, and also thanked the Key Club of Pahrump Valley High School for their assistance. Adviser Reva Braun and four members were on hand to help out. “I just always like to help,” Key Club member Clovis Townsend said as he and Viera Domingo handled raffle tickets. Braun said she also was at last year’s tournament with several club members. Kerr also expressed gratitude to Mountain Falls and golf pro Randy Mudge for their support. The success of the event guarantees it will be back next year, when Kerr thinks they can do even better. “We had 14 teams for 18 holes,” she said. “We did fine, but I think maybe the Saturday kept people home. So we’re going to try Friday next year because we had a lot of companies that said they would have sponsored a team, but guys would rather play on a day they can get out of work. “I don’t blame them,” she added with a smile. But there was no doubt the day was a success. As for the actual golf, Derek Fowler won the long drive contest for his shot on No. 9, and Molly Clark won closest-to-the-pin honors for her shot on No. 8. The Nevada Realty men’s entry won the tournament with a score of 59, while the women finished last with an 85, “winning” golf lessons for their efforts. “The men cheat better than the women,” Mudge joked. As the Nevada Realty women also placed last the previous year, there were some suggestions they were hooking and slicing on purpose to win free lessons.